We gave it everything we had, but it wasn’t enough. It wasn’t enough because … well … because the other side gave everything they had, too, didn’t they? It all just … cancels out in a way. Matter meets antimatter. Total annihilation. You must forgive these delirious thoughts. I have seen man’s humanity torn to tatters by faith and country. I have seen a billion men, half on each side, tear one another to shreds with machines and fire and shrapnel. I have seen heroic deeds, seen heroes fall, and watched men drown in fields turned to swamps of still-warm blood. This morning I was ankle-deep in that mire. Tonight, I stand atop the closest thing to a mountain these plains will ever know—a hill some three hundred meters tall, capped with a shelf of rock. As good a place as any to witness the end of a species, I suppose. Once, from this spot, you could see cities in the distance, but the lights have all gone out now, leaving the stars naked in the sky, unbearably close. I do not know how I survived and, more to the point, I cannot fathom why. But if I am, as I suspect, truly the last of us, then I feel … responsible, somehow. Entrusted. I have to write it down. Why? A valid question. Surely not as a warning; there’s no one left to warn and there never will be. Besides—Christ—we knew what we were doing. As soon as the first bombs fell, we knew, but pride and hatred pulled us on. Before the first year was out, civilization had been brought to its knees, but we carried on. And now there is this. Now there is nothing. No, this isn’t a warning. It’s a eulogy. It’s a memorialization of the promise that was humanity. It’s a remembrance of sunlight. Of brotherhood and whiskey and hot summers and cold nights. The grandeur of Europe, the regality of Africa—the sweep and scope and power of the Asian steppes. There were ancient cultures who believed they could bring their gods into the world simply by speaking their names. They would chant the names for days on end—as though the words themselves held the substance of their divine being. These are my words, then: Sunlight. Brotherhood. Whiskey. These are our fallen gods. Speaking them aloud, I feel they may not be gone from the world after all. Not entirely. The earth spins round the sun, but—by a trick of perspective made possible only because we are very, very small—seems to hold the sun in her gravity instead. Call it delusion or call it optimism, but it is hard to shake the feeling that all of this is for us. When I sat down to write this note, I fully intended it to be my final act upon this planet, but the words have taken hold. Even now the east is brightening and my legs grow restless. I think I’ll have a walk. I think I’ll fold up this paper and take these words and find someone to share them with. Maybe we’ll say them together. Maybe we’ll chant. Maybe we’ll wake the gods again. 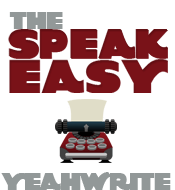 I’m shaking off the cobwebs this week and submitting my first entry ever into the Speakeasy challenge at YeahWrite. I don’t think the story requires much explanation, so I’ll just let it speak for itself. Let me know what you think in the comments below. If you’re new to my site and new to my writing, check out the fiction section and poke around a bit! I like your writing. This piece is incredible. Glad you linked up! This is a great piece. Well crafted and enjoyable. Thanks for putting it out there. Powerfully written and engaging from the first words. Glad to see you join in! I like the contrast of the end-of-times beginning with the little bit of hope at the end. Sunrise is a great sign. This is…stunning. Every word, every comma, every breath used to full effect. Absolutely beautiful writing. And I love the last few lines. “This isn’t a warning, it’s a eulogy.” And the part about there being no one left to warn – wow, just wow. Great writing. I was hanging onto every word…so beautifully written, elegiac and anthemic, despairing and hopeful. Love your bold, unabashed writing style.